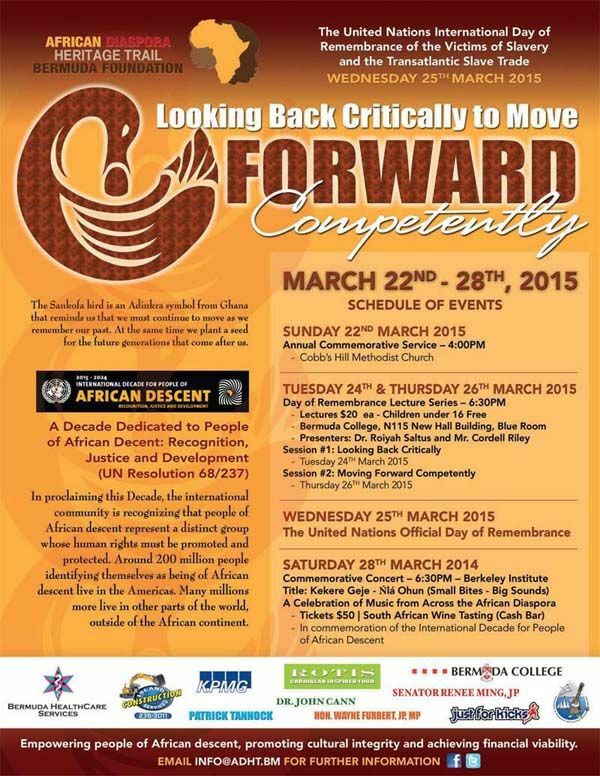 During the week of 22nd – 28th March 2015, the African Diaspora Heritage Trail [ADHT] Bermuda Foundation will host its annual series of events in commemoration of the United Nations International Day of Remembrance for the Victims of Slavery & the Transatlantic Slave Trade. A spokesperson said, “The International Day of Remembrance was adopted by a UN Resolution in 2007 and is observed on 25 March each year to honour and remember the over 15 million men, women and children who were the victims of the transatlantic slave trade, one of the darkest chapters in human history. The International Day of Remembrance, first observed in 2008, also aims to raise awareness about the dangers of racism and prejudice today. “2015 is also the start of the United Nations International Decade for People of African Descent 2015 – 2024, which has as its focus: Recognition, Justice and Development. “The ADHT has been able to secure local and international presenters to participate in this year’s events. The events start with the annual church service at Cobbs Hill Methodist Church, which has hosted this special service each year since 2012. “Our 2nd annual lecture series will take place on Tuesday and Thursday, 24th and 26th March in the Blue Room at the Bermuda College. The College is an integral part of this year’s commemorative activities as they are providing use of their facility with no charge to the ADHT for the lectures. Cost of tickets for each lecture is $20. “This year’s presenters are: Dr. Royiah Saltus, Bermudian sociologist who is presently Principal Research Fellow in the Faculty of Life Sciences and Education at the University of South Wales and Mr. Cordell Riley, M.Sc., JP. “In addition to his role as Coordinator for Institutional Research and Planning at the Bermuda College, Mr. Riley is a former government statistician; past president of Citizens Uprooting Racism in Bermuda [CURB] and also Managing Director of Profiles Bermuda. “In addition to these presenters, Mr. Edmond Moukala, Chief a.i. of the Africa Unit of the UNESCO World Heritage Centre, and member of the ADHT Board of Directors, has been invited to participate in this year’s events. He will talk about his work with UNESCO on universal sites of memory which are related to the history of slavery and the slave trades; and about the financing and sustainable management of these sites. “The final event will be the Kekere Geje- Ńlá Ohun [Yoruba for Small Bites –Big Sounds] Concert. This concert, which is in celebration of the International Decade for People of African Descent, will take place at the Berkeley Institute on Saturday 28th March at 6.30pm. “Using a variety of local artists, the concert will showcase the global musical genres that have their roots in the slave trade – jazz, blues, gospel, soul, R&B, reggae, hip hop, tango, capoeira and others. “Our Patron for this concert is Mr. Rotimi Martins. Mr. Martins, originally from Nigeria, has given unstintingly of his time and talents to the arts community in Bermuda. Tickets for the concert are $50. Soft drinks will be on sale as well as South African wines by the glass or bottle.